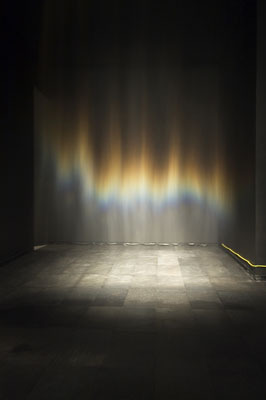 Olafur Eliasson, Beauty, 1993, mixed media, installation view, AROS, Aarhus Kunstmuseum, Aarhus, Denmark, 2004. Photo: Poul Perdersen. © Olafur Eliasson 2007 / Artists Rights Society (ARS), New York, NY / COPY-DAN. Few artists produce work as conceptually rigorous and simultaneously crowd-pleasing as Olafur Eliasson, who makes art in which capital-P Phenomenology traffics freely in fun-house aesthetics. His 2003 Weather Project illuminated nearly two million visitors at Tate Modern with a spectacular artificial sun, but US museumgoers have had precious few opportunities to experience firsthand the viewer involvement so central to Eliasson’s practice. Now, this midcareer retrospective—twenty-two of the artist’s sculptures, photographs, and installations made since 1993—promises to make up for lost time. The catalogue features essays by curator Madeleine Grynsztejn, Daniel Birnbaum, Pamela M. Lee, and others, as well as a conversation between Eliasson and Robert Irwin. Travels to the Museum of Modern Art and P.S. 1 Contemporary Art Center, New York, Apr. 13–June 30, 2008; Dallas Museum of Art, Nov. 9, 2008–Mar. 15, 3009.